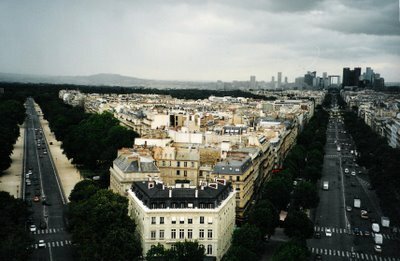 I love Paris (having lived there 1998-99), and I love skyscrapers, so I just had to save the photo from the article and include it here. 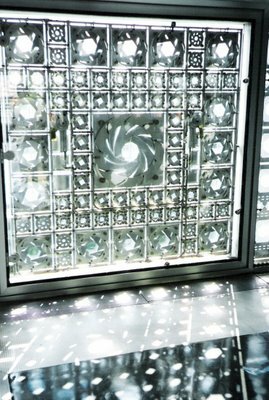 Called "Phare" (lighthouse), the tower is scheduled to be completed by 2012 in the "La Défense" district in western Paris. Designed by Thom Mayne of the Los Angeles-based firm Morphosis, the Phare Tower will rise amid the office towers of La Défense, the western business district conceived in the late 1950s as a way of expanding the city while protecting its historic core from overdevelopment. Embedded in this maze of generic towers and blank plazas, the tower will overlook the hollow cube of the 1989 Grande Arche and the elegantly arched concrete roof of the 1958 C.N.I.T. conference center. Mr. Mayne dug deep into the site's convoluted history to create a building of hypnotic power. Viewed from central Paris, the building's gauzy skin, draped tautly over the tower's undulating form, will have the look of luxurious fabric. But as you draw closer, the forms will appear more muscular, with massive crisscrossing steel beams supporting a perforated metal surface. The aura of the veil has a titillating vibe, but there is nothing superficial about this design. 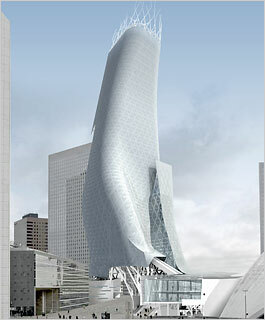 By drawing on what energy the site has - a tangle of roadways and underground trains - the tower transcends La Défense's deadening urban reputation. Supported by a series of gargantuan steel legs evoking a tripod, the tower straddles the site, allowing pedestrian and train traffic to flow directly underneath. The skin lifts up to envelop a nearby plaza, linking it to an underground train station. Beneath this perforated metal skirt, gigantic escalators shoot up more than 100 feet to a lobby packed with restaurants and cafes. The approach recalls the machine-age fascination with physical and social mobility that yielded masterpieces like the Gare de Lyon in Paris and Grand Central Terminal in New York. Pushing the idea further, Mr. Mayne rips the top off an existing plaza to reveal the trains and traffic passing underneath. 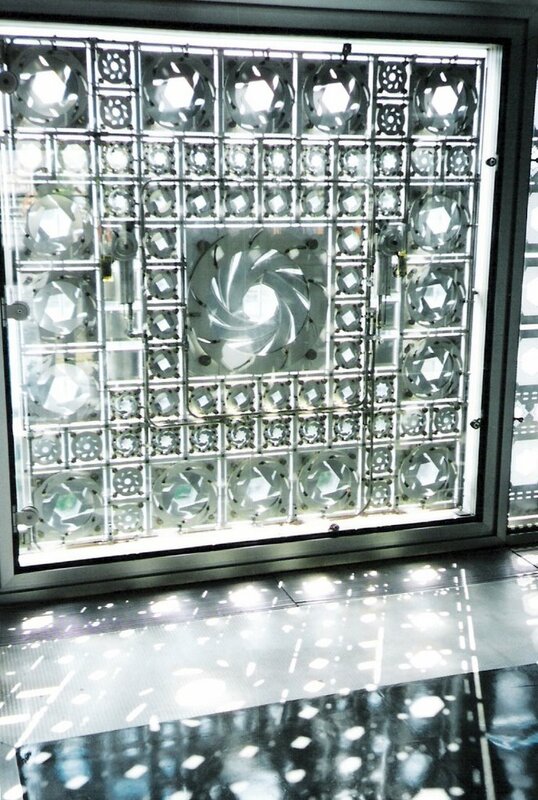 As you ride up escalators linking the plaza to the lobby, seams open up in the building's skin to create vertiginous views of both an underground world of shadowy figures and the monuments of the beloved city past the Arc de Triomphe to the east. The notion of building as machine is tempered by the structure's earnest environmental agenda. Double-layered skin on the south side of the building will deflect the harshest sunlight. On the north side, the surface peels apart to reveal transparent glass skin. The tower's peak, conceived as an extension of the skin, seemingly fraying apart in the breeze, consists of a cluster of antennas and a wind farm that will generate electric power. 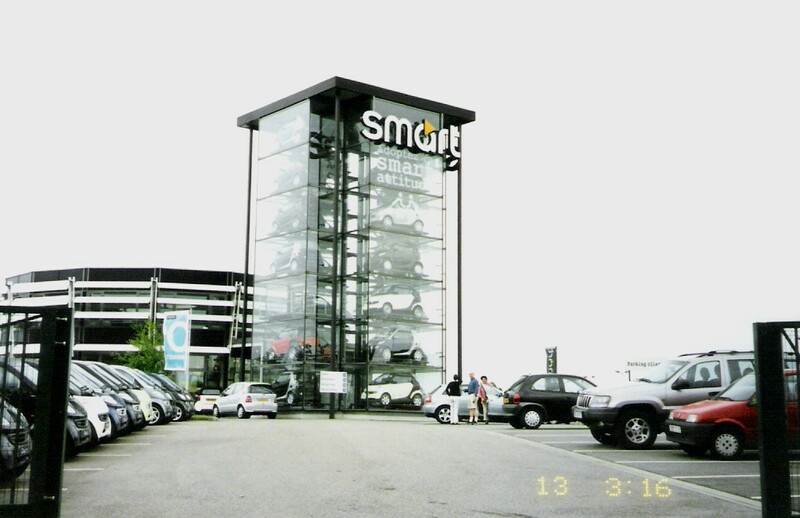 Oui, mon ami, you're looking at a car-dealership with a car-vending-machine! Parking's a pain in European capitals, so the smaller the better, n'est-ce pas? Ah, what better way to pass a few minutes at 5:50am at a coffee stand on a dark Vashon morning than to dream of walking through a Paris neighborhood (or racing through it's streets on a punchy Smart car). Thanks Joe.